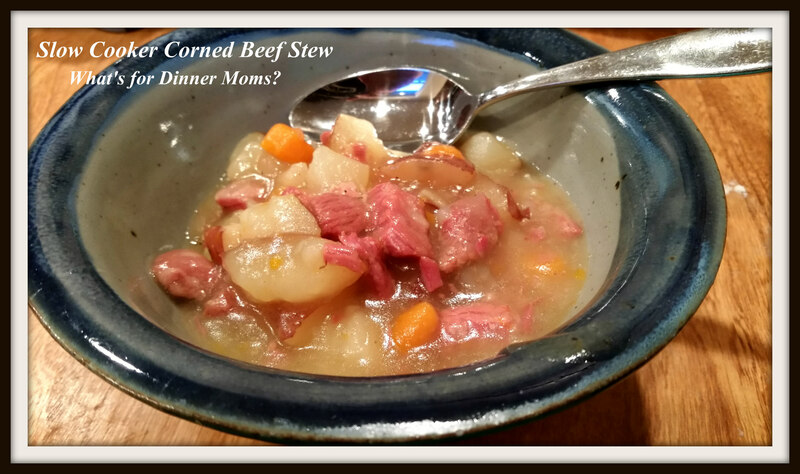 Slow Cooker Corned Beef Stew – What's for Dinner Moms? Using up my frozen Corned Beef leftovers from St. Patrick’s Day I made a simple stew in the slow cooker. It was nice to come home to the smell of corned beef filing the house and knowing with a nice loaf of crusty bread and some butter dinner would be ready! Corned beef is a bit salty normally so the soup was a tiny bit too salty but when we talked about how that is the flavor of the corned beef we all decided it was as it should be. Both of my Corned Beef loving kids had two bowls and quickly claimed the leftovers for lunch the next day. To us that means this is a winner! I served this with a loaf of crusty bread and some butter for dipping in the broth. For my mostly gluten-free son the best part was that with some gluten-free bread this meal was gluten-free! Place chicken stock, potatoes, carrots, corned beef, garlic powder, onion powder and black pepper in slow cooker bowl. Stir and cook on low for 7-8 hours. Thirty minutes before serving mix corn starch and cold water in a small dish until corn starch is fully dissolved. Pour mixture into slow cooker and stir well. Turn slow cooker to high and cover. Check in 15 minutes. If stew is not thickening enough repeat corn starch and water mixture with 1 tablespoon of each. Once stew has thickened to your liking taste the stew and adjust spices. Serve hot. yumm that would be so good to dip some crusty bread in! It was delicious with the butter melting on the bread. We get stuck in the Reuben sandwich rut, we’ll have to give this a try sometime! I also have recipes for Reuben Egg Rolls, Irish Nachos and Irish Tacos with Guiness Sauce on here. You may want to take a look at those too! I did not cook a corned beef for St. Patty’s Day so no leftovers. This makes me want to go buy one just to make this stew. I love coming home to dinner cooking itself in the crockpot! I buy 4-5 when they are on sale near St. Patrick’s Day to throw in the freezer and make throughout the year. We LOVE Corned Beef. Leftover corned beef soup is awesome! Too bad our corned beef is long gone, lol. Wonderful idea! The thick broth looks amazing! It was good! The whole thing had that salty, tang to it from the Corned beef which made the bread for dipping taste so good. Pingback: Leftover Corned Beef? Here are 5 Recipes to Try! – What's for Dinner Moms?